We are a group of avid fishermen: COAF Field Team. 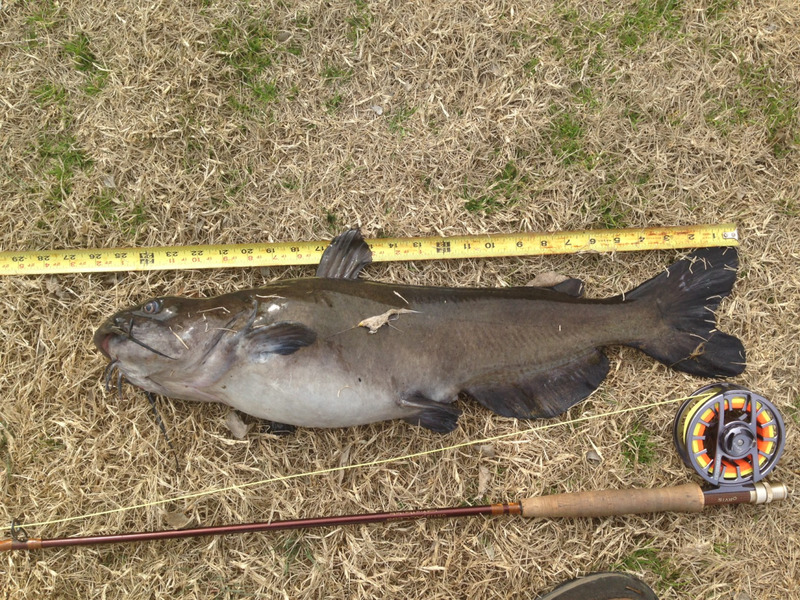 We post tips on our blog and publish articles for those who may be interested in fishing! The Guadalupana fishing fly is a versatile pattern that originated on the Guadalupe River in Texas. 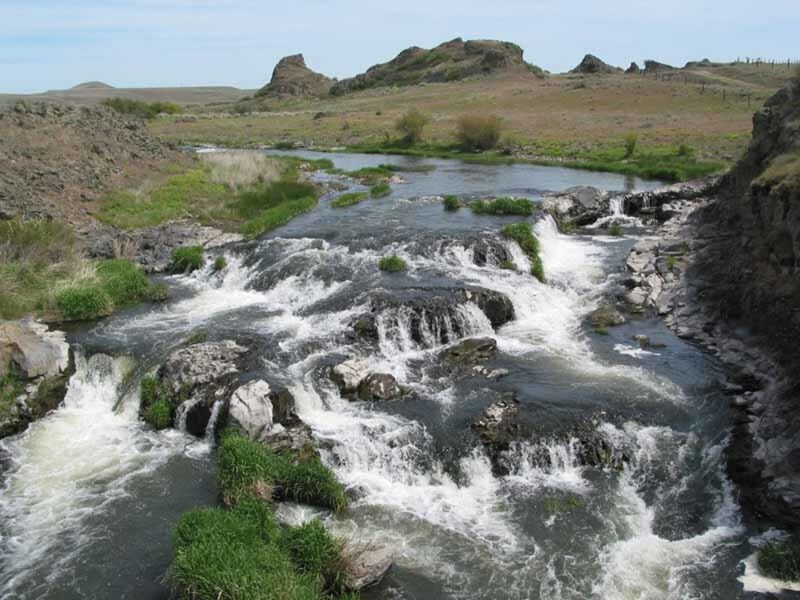 It was developed by a local fisherman to target Rainbow Trout as well as Bass. The Guadalupe River - specifically the Lower Guadalupe River below the Canyon Lake Dam, is stocked with Rainbow Trout each year by Texas Parks and Wildlife and Guadalupe River Trout Unlimited. 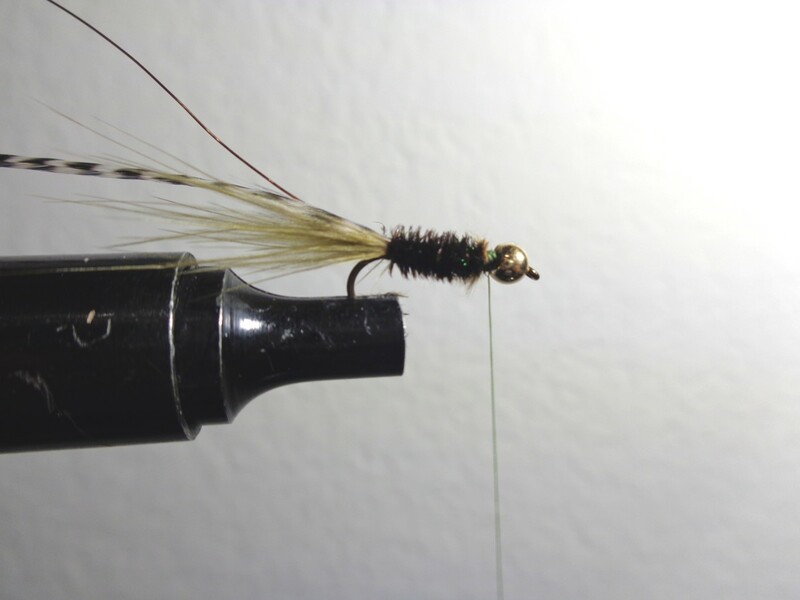 The Guadalupana is a large fishing fly tied with a size 10 streamer hook. It works on Rainbow Trout as well as Largemouth Bass, Smallmouth Bass, Sunfish, Bluegill, and Rio Grande Perch. 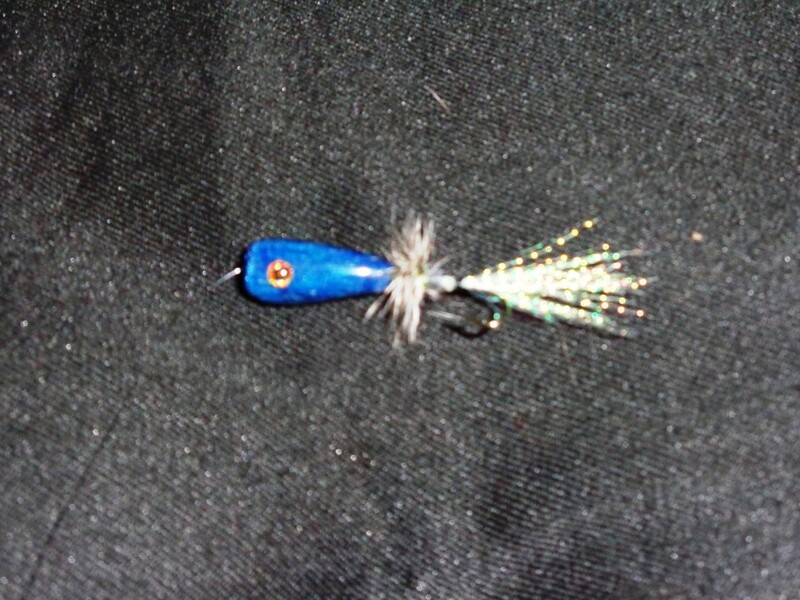 It is a simple pattern that uses readily available material common to other fishing flies. 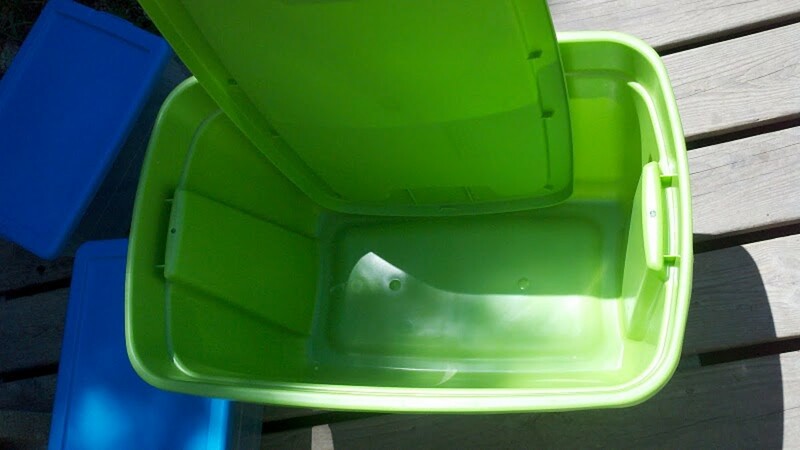 Moreover, it can also be modified to "match the hatch" as needed. If the bait fish are smaller than expected, downsize the hook size. 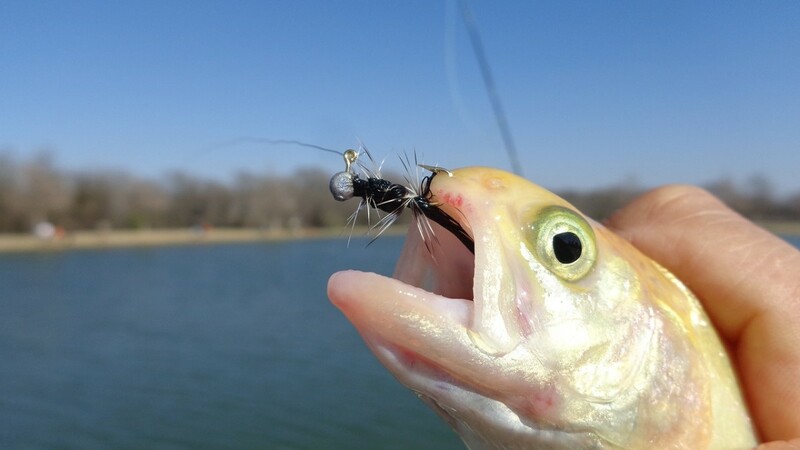 If the bait fish are larger, adjust and use a larger hook size. In keeping with its versatility, a variant of the Guadalupana was developed by a member of the COAF Field Team - a group of fishermen in North Texas who formed a fishing club for no other reason than to fish! 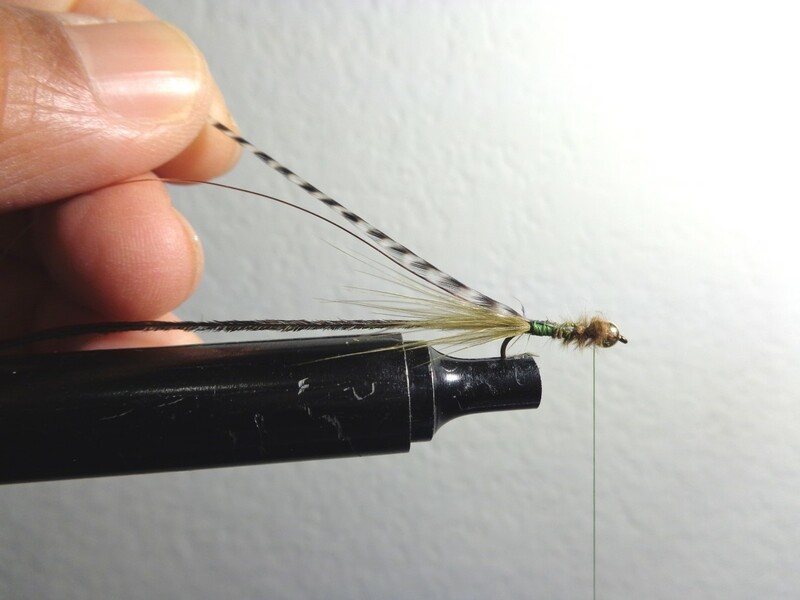 The variant - COAF Guadalupana Fishing Fly, is similar to the original pattern except it uses a smaller streamer hook and a grizzly hackle instead of an olive hackle that is tied palmer style. The smaller size seems to work well on the Rainbow Trout (that range from 9"-12" in length) that are stocked in community lakes and ponds in the COAF Field Team's area. 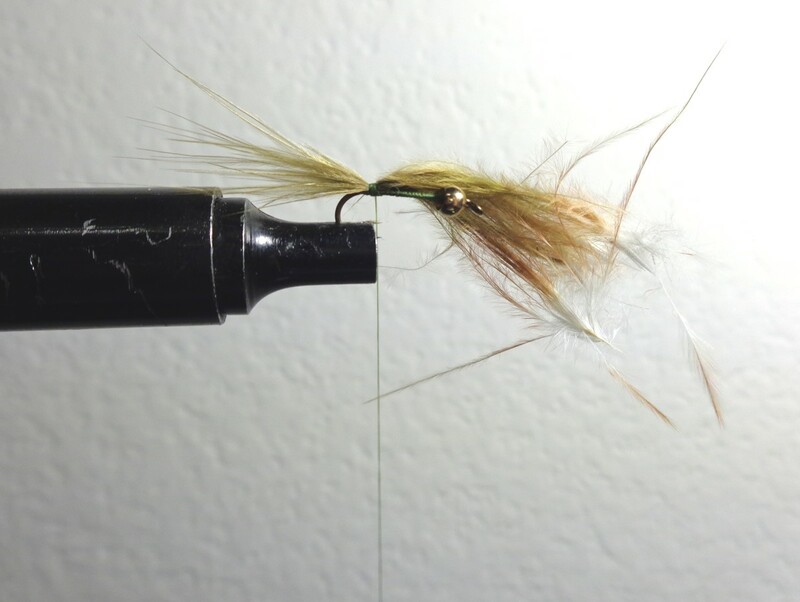 For details on tying the COAF Guadalupana Fishing Fly, refer to the sections below. 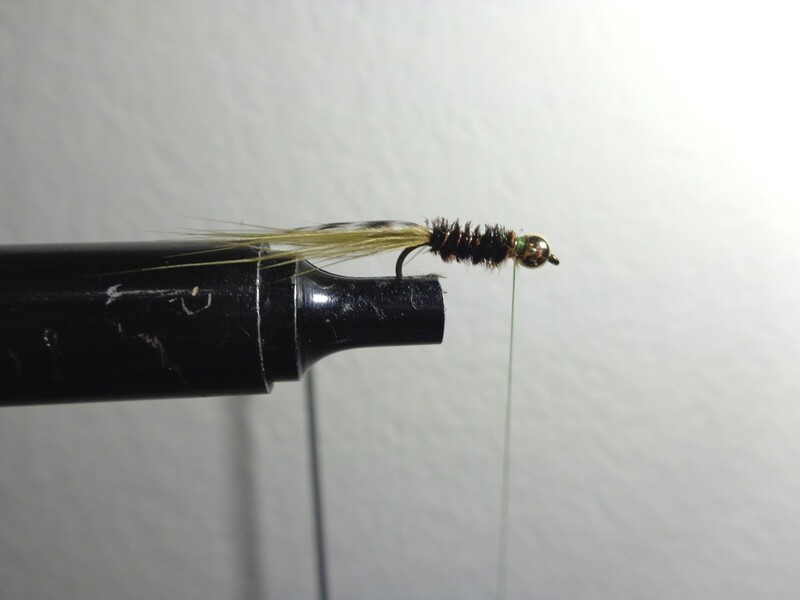 Thread the 1/8" Brass Bead on the Size 14 Streamer Hook and set in the fly tying vise. 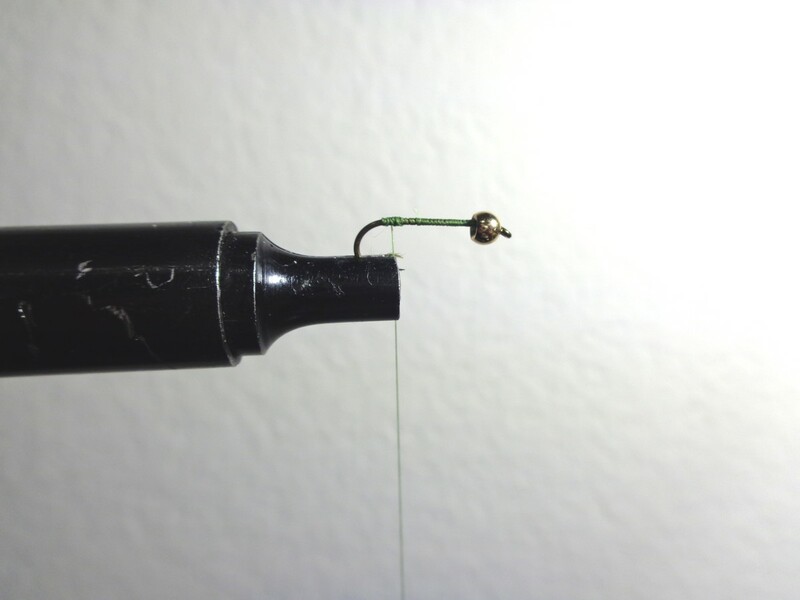 Lay a base of thread on the hook shank, forming a slight "bump" where the hook bend starts. Ensure the thread wraps stop at the hook bend where you formed the "bump". 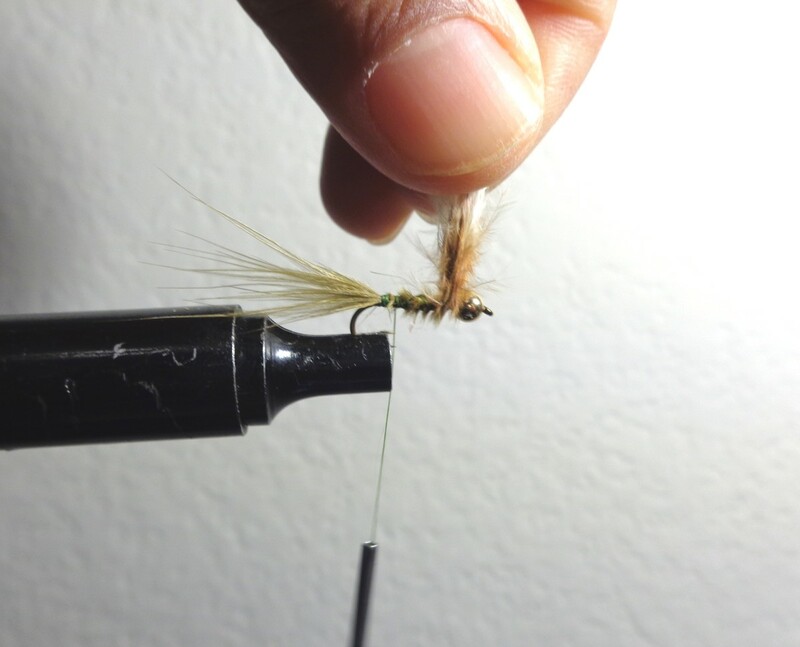 The "bump" helps form the marabou tail in the next step. Next, set the Olive Marabou on the hook and adjust its length form a tail that is the same length as the hook shank. Begin wrapping the Marabou to secure it on the hook where the "bump" in Step 1 was formed. 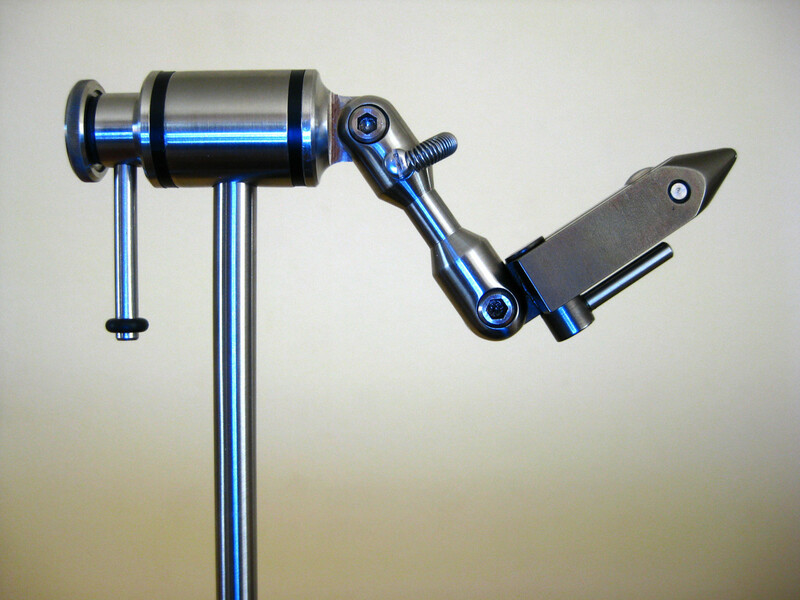 Once secure, leave the bobbin hanging and proceed to Step 3. With the bobbin hanging free, begin wrapping the remaining end of the Marabou around the hook from back to front. Stop wrapping the Marabou when it is snug against the Brass Bead, and then secure it in place by wrapping the tying thread from back to front and then back again. The tying thread should end up at the back where the "bump" was formed and the tail begins. Next, let the bobbin hang free again, and cut the tag end of the Marabou as close to the Bead Head as possible. Then, proceed to the next step. Next, secure about 2" of Copper Wire, one strand of Peacock Herl, and then the Grizzly Hackle on the hook shank as shown in the sidebar picture. Be sure to tie them in the order listed - specifically, Copper Wire, Peacock Herl, Grizzly Hackle. Also, once secured in place continuing wrapping the thread to the front, stopping just behind the Brass Bead. Secure the thread in place with a half-hitch and then set the bobbin out of the way, letting it hang free or placing it on a holder. Then, proceed to Step 5. In Step 5, the Peacock Herl is wrapped from back to front to form a "buggy looking" body. As the Herl is wrapped, overlap wraps to ensure no gaps are visible. Once done, secure the tag end just behind the Brass Bead, and then proceed to Step 6. Next, the Copper Wire is wrapped around the Peacock Herl body. 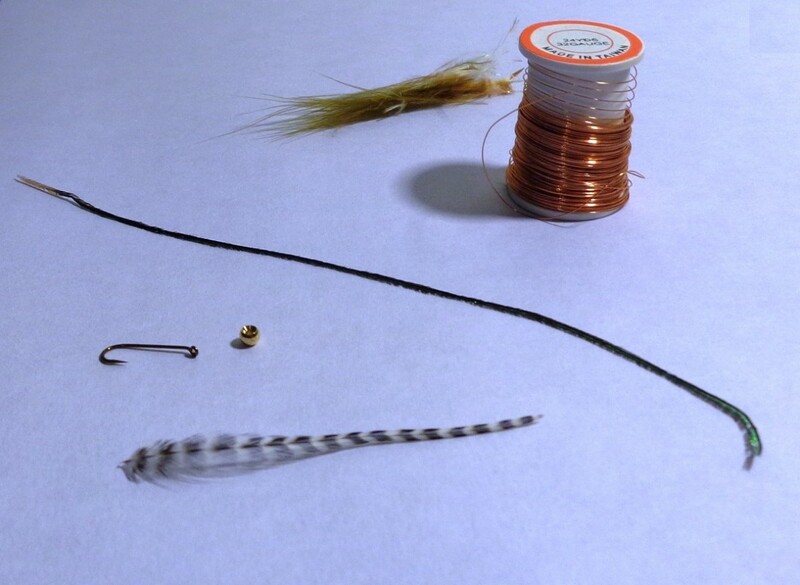 Note: Some prefer tying the hackle first, and then the wire. 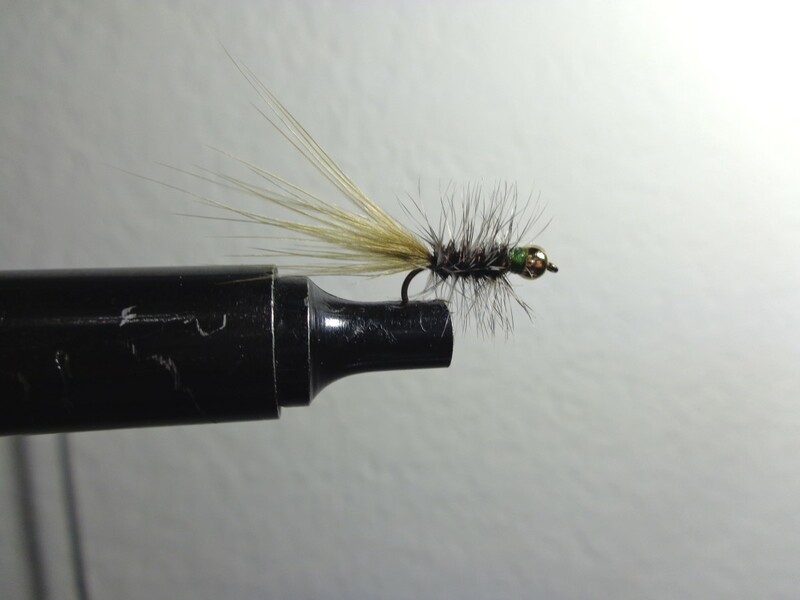 This allows the wire to secure both the herl body and the hackle and makes for a more durable fishing fly. Starting from back to front, wrap the Copper Wire to form equally spaced wraps around the body. Stop just behind the Bead Head, make one more wrap tight against the Head Head, and then secure the wire in place with a couple wraps of tying thread. Next, Palmer wrap the Grizzly Hackle from back to front much like the hackle is wrapped on a Wooley Bugger. Stop just behind the Brass Bead, secure the tag end with a couple wraps of tying thread, and then cut off the excess hackle. Next, continuing wrapping tying thread just behind the Bead Head to ensure the Bead Head is snug and does not slide back and forth on the hook shank. Finally, whip finish to secure the thread, cut the thread, apply head cement, and then let dry. Note: If desired, the Grizzly Hackle can be omitted from Step 5 and added to Step 7. Specifically, after completing Step 6, secure the Grizzly Hackle to the shank about 1/8" behind the Brass Head and then wrap it using a Wet Hackle technique instead of the Palmer Hackle technique. This follows the original Guadalupana pattern. Below are several videos from the COAF Field Team using the COAF Guadalupana Fishing Fly (as well as other fishing flies) for Rainbow Trout. Note the size of the Trout range from 9"-12" in size which is the normal size Rainbow Trout stocked by Texas Parks and Wildlife. Also, the majority of the fish were caught using the pattern described in this article. Good Luck and Good Fishing! 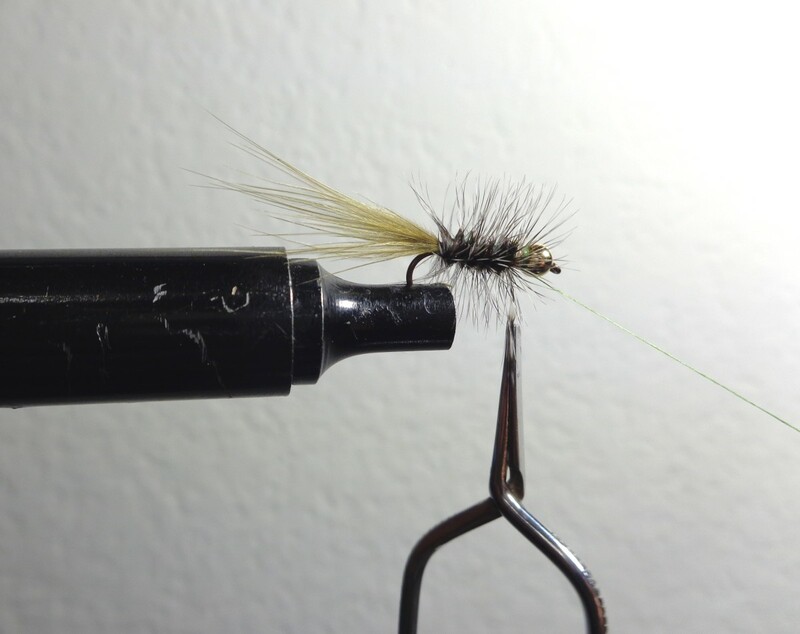 Griffith's Gnat on a Caddis Hook! Keeping this one in our backpocket for the upcoming Trout Stocking Season. Works well... just torn between it and the Near Deere! Had a request from one of our Readers about a fishing fly pattern that we use when fishing for stocker rainbow trout in our area. Hope this helps others hook a trout or two this season!